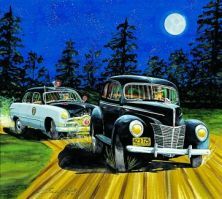 "The Great Moments in Racing Series"
Junior Johnson's '40 Ford moonshine hauler being chased by a '49 Ford North Carolina Highway Patrol car under the full moon! 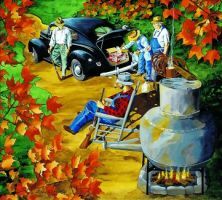 Autumn scene at the still as Junior Johnsons's '40 Ford is being prepared for the night's run. 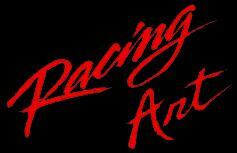 "The Pass In The Grass"
Dale Earnhardt's remarkable trip through Charlotte Motor Speedway's grass holding off Bill Elliott in the 1987 NASCAR All-Star Race The Winston. 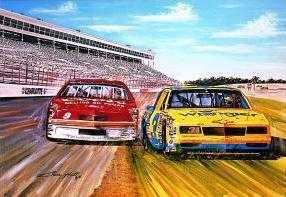 The first driver autographed fine art print edition in NASCAR!